Dr. Samson, a Board Certified Plastic Surgeon, has been performing Facelifts for 18 years. Before joining Dr. Larry Slade (now retired) in 2012, Dr. Samson served 14 years at Cleveland Clinic as a Senior Plastic Surgeon and head of the Plastic Surgery Residency Program, training some of the US’s top up and coming Plastic Surgeons. Dr. Samson has a very gentle approach to facial plastic surgery, giving his patients ideal outcomes that enable them to look refreshed and rejuvenated. A facelift is the most comprehensive approach to treating facial wrinkles and sagging caused by aging. A facelift removes excess skin, tightens underlying tissues and muscle and redrapes skin on the face and neck. It can correct midface sagging, marionette lines, jowls and a double chin, maintaining its reputation as the ‘gold standard’ for facial rejuvenation. 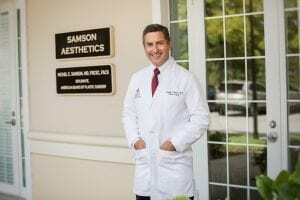 Dr. Samson routinely performs facelift surgeries not only on patients in the Daytona Beach area, but worldwide patients come to Dr. Samsons office in Port Orange for their facelift surgery. These are the top three pros and cons to weigh when considering a facelift. In your one on one consultation with Dr. Samson, you and he can go over together your most desired outcomes for surgery. How will Dr. Samson perform my facelift? Facelift techniques can focus on the lower facial areas, such as the jawline, jowls and cheeks, the midface and even the forehead. In some techniques, deeper facial tissues may be repositioned or tightened to restore a more youthful contour. In other techniques, removal or addition of fat or other soft-tissue fillers may be necessary to achieve the best results. Today, many different techniques exist with outcomes that can be consistently reliable, safe, and durable. Your incisions will depend on the area of the face that is targeted and the amount of change you want. In your consultation with Dr. Samson, you and he will create a detailed plan for what your focus will be. Once the incisions are made, various degrees of ‘undermining’ of your skin is performed, and the deeper layers of your face are lifted. Undermining separates the overlying skin of the face and neck from the muscles and tissues deep to the skin. This frees or loosens facial and neck skin so it can be redraped at the end of the procedure, making sure skin is smooth. Then, Dr. Samson will raise the skin from the temples, cheeks, and neck, and lift and reposition the underlying connective tissue, removing excess fat and skin. If this procedure is performed in conjunction with a neck lift, Dr. Samson will draw the neck muscles together, stitching them together at the midline to form a strong sling of muscles that supports the entire neck and jaw. Dr. Samson may also include liposuction of the neck and jowls, as requested/needed. Facial implants may be added to increase cheek or chin volume. Finally, Dr. Samson redrapes the skin over the new underlying structure and closes the incisions with dissolvable stitches. Where needed, drainage tubes may be inserted. A padded, supportive dressing will be applied. Dr. Samson’s goal is to help you achieve the most beautiful and natural-looking results, and to make your surgical experience as easy and comfortable as possible. What will my facelift incisions and scars be like? Regardless of the type of facelift you undergo, you will have incisions that involve the skin around your ear. The incision line usually runs along hairline and within the natural contours in front and behind the ears. Skin is then pulled back and the incision is closed. Dr. Samson will make incisions in your hairline at the temples, continuing down and around the front of your ears and hidden in the natural creases behind your ears in your lower hair-bearing scalp. For the neck lift, Dr. Samson will make incisions starting in front of your earlobes and continuing around behind your ears in your lower scalp. There will also be a small incision underneath your chin. Facelift scars can be virtually invisible: narrow, flat, and well placed behind the ear so you can wear your hair close-cropped.Dr. Samson will place the incision in areas that are hidden and in areas where the scars look like natural wrinkles. Incision healing depends on surgical technique, infection prevention, reduction of tension, your nutrition, any known or unknown underlying medical conditions, no smoking, and your genetic tendencies.There is a risk of ‘hypertrophic scars’ and ‘keloids’ anytime the skin is cut. This risk is greater in darker-skinned people such as African Americans and Hispanics. Injections of a corticosteroid medication or other treatments, might be used to improve scar appearance. After your face lift surgery, a bandage will be applied to minimize swelling and bruising, and a thin drainage tube may be used to remove any excess blood or fluid from under the skin. You will be given specific instructions regarding care for the incisions, medications to take, and when to follow up with Dr. Samson. (usually he will ask you to come in one day post op) Face lift recovery time varies among patients. Most patients see significant results in just a matter of weeks. The cost of facelift varies depending on the technique used, along with many other factors including the cost of anesthesia, the surgical facility, and any medical tests and prescriptions you may need. Dr. Samson can give you an accurate cost estimate for your specific needs during a one-on-one consultation. Many men and women often choose other procedures to be combined with a face lift to complete their look. These include a brow lift, eyelid surgery, and skincare treatments. If you are interested in any of these procedures, schedule a consultation today by calling 386-756-9400 or fill out our contact form. How do I prepare for my facelift ? Stop smoking six weeks before your surgery to promote good wound healing and to reduce scarring. Smoking also increases your risk of serious complications. Avoid taking aspirin, nonsteroidal anti-inflammatory medications (NSAIDs: Advil, Motrin, Aleve) and vitamins/homeopathic regimens. These can increase bleeding. If you color your hair, you should do it just before surgery or you will need to wait at least a month. Stock your refrigerator with lots of fruits and vegetables and lean protein. Lean protein assists in healing. Sodium increases swelling; avoid it! Prepare frozen meals in advance. High protein, low sodium, soft foods are best for the first couple of days. Plan where you will recuperate. If you have a recliner chair, it is best for elevating the feet, knees and head. If you do not have a recliner, be sure to have lots of pillows available to prop up your head and knees. If possible, keep your phone and remote control for the T.V. by your bed. Decide what you will wear for the first few days; pick items that open in front and do not have to be pulled over your head. The same kind of clothing should be worn on the day of surgery. Wear slip-on shoes. Be sure to get plenty of rest and plan on not doing any housework, heavy lifting, or exercise. Avoid hot showers, hot tubs and saunas for two to three weeks. What can I expect on the day of my facelift surgery? Facelift surgery requires at least several hours to complete, though more extensive procedures may take longer. Local anesthesia combined with sedation is commonly used during facelift surgery, though general anesthesia can be used instead. An anesthesiologist or nurse anesthetist will be present to administer sedatives (or general anesthetic) and assist in monitoring. For your safety during the surgery, various monitors will be used to check your heart, blood pressure, pulse, and the amount of oxygen circulating in your blood. Dr. Samson will follow the surgical plan discussed with you before surgery. After surgery, you will be taken into a recovery area where you will continue to be closely monitored. Your incisions will likely be covered with bulky bandages that provide gentle pressure to minimize swelling and bruising. A small tube might be placed under the skin behind one or both of your ears to drain any excess blood or fluid. Before leaving for home on the day of surgery, you or someone looking after you should feel comfortable emptying and resetting the drains. Dr. Samson and the Surgery center staff will go over all post op instructions carefully with you. Under no circumstances will you be permitted to go home alone. What will my recovery and healing from a facelift be like? You may be placed in a compression garment or wrap immediately after surgery. Wear this exactly as directed. Remove it only as directed for cleansing incisions or showering. To minimize swelling, recline rather than lie down. This will be more comfortable for you, and can reduce swelling. Always keep your head elevated. Do not bend forward or over. You will have a mild to moderate amount of pain and discomfort. This should be easily controlled with oral medications. If it is not, call Dr. Samson right away. The discomfort and pain should begin to decrease within forty-eight hours after surgery. If you have a significant increase in pain after this period, call Dr. Samson Severe pain is rare; if you experience this, call Dr. Samson immediately. Expect bruising and swelling. These symptoms will peak within the first thirty-six to forty-eight hours after surgery and will gradually subside over the next ten to fourteen days. To minimize swelling, sleep with your head elevated for a couple of weeks after the surgery. It is not unusual to have some slight drainage for the first forty-eight hours. A bulky cotton compression dressing with drains will cover your scalp and face for one to two days to help prevent blood collections under the skin. You may not drive for at least a week after surgery. A feeling of tightness in your neck is not unusual after surgery. This sensation is most pronounced in the first one to two days after surgery while the bulky dressing is in place. During your first postoperative visit, the bulky dressing and usually the drains will be removed. You may be placed in a supportive elastic face garment that is to be worn according to Dr. Samson’s instructions. Do not take any aspirin or any anti-inflammatory compounds for two weeks before and two weeks after your surgery unless you first discuss it with Dr. Samson. It is recommended to sleep with your head elevated forty degrees for two weeks; an additional pillow or two under your mattress may help, if necessary. Apply cool (not cold) compresses to your eyes. Do not apply ice or anything frozen directly on the skin. Soak soft, white washcloths or gauze squares in ice water and wring out well. Apply directly to the eyes, but not to the cheeks or neck. Do not apply any pressure. Apply cool compresses for no longer than twenty-minute intervals. Do not apply heat. Stay up (sitting, standing, walking around) as much as possible after you return home. This helps to decrease facial swelling. Avoid bending or lifting heavy things for one week. Besides aggravating swelling, this may raise your blood pressure and encourage bleeding. You may wash your hair gently twenty-four hours after your surgery. Do not use the usual heat-type hair dryer; use the cap type or use the cool setting on the blow dryer. You may shower or bathe the day after surgery, but do not let the spray directly strike your face. It is permissible to get your suture lines wet, however. Report any excessive bleeding that persists after applying pressure for fifteen to twenty minutes. Don’t go swimming, diving, water skiing, or participate in strenuous athletic activity for at least one month after surgery. You can expect to experience some numbness around your ear lobes, face, and neck for several weeks after surgery. Refrain from any strenuous exercise and from bending or lifting. You may begin sleeping in a modified reclining position, but do not sleep lying flat or on your stomach. If you are a side sleeper, two pillows under your head and a soft pillow under your mid-back and shoulders may offer more comfort. Do not wear makeup until you have been told to do so. During the first four to six weeks your scars may appear red and be slightly firm and raised then the redness fades and the scar softens. It takes a minimum of one year for the scar to achieve its final appearance. Refrain from direct sun exposure. Wear sunglasses and a wide-brimmed hat. If you are outdoors, apply at least an SPF thirty at least thirty minutes before sun exposure. Your face will be highly susceptible to sunburn or the formation of irregular, darkened pigmentation. You may ease into your regular fitness routine. However, wear protective eyewear and a hat. Discomfort or tightness and tingling in your face will resolve. Be prepared to wait at least six months for your facelift to completely heal inside and out. It is important to see your doctor as scheduled. Day 1: The day of surgery was really a complete blur for me after I got home. I was both excited and nervous on what I had done to my face. I remember watching movies on Netflix and having to take the pain medication, drinking smoothies, and using cold compresses over my eyes. The bandages were all over my face and head. I had a hard time seeing and hearing. We even decided to put our small dog at the kennel. I did not want to scare even her. My husband did the best thing by not taking a picture of me and taking good care of me. A good tip is to hide your cameras in your home. Day 2: I went to Dr. Samson’s office. My husband drove me, and they escorted me directly into a room. You cannot even imagine what I looked like, a mummy head for Halloween. The bandages were taken off and I looked a mess. Iodine was in my hair and there was swelling and stiffness in my neck and my upper eyes because of the disposable stitches. I could not wait to get home and take a shower. After, I and felt more human but could see visible results. Another tip is not to wear a good shirt to this appointment, it was a bad scene almost a crime scene shirt. Day 3: I was still very tired from the surgery and slept and I took many showers. My eyes were feeling better. I had major bruising around my throat and on my cheeks, which was above and below my eyes. I didn’t even want to walk to the mailbox yet. My husband gave me words of encouragement. Another tip is let someone else get your mail and don’t answer your front door. Day 4: On my first outing, I wore a scarf, hat and sunglasses and went to a movie. I was starting to see better but there was definitely a tightness on my neck and chin. It just takes time. Movies are a good place to hang out because no one is watching you, another good tip. Day 5: Another outing and little by little I started to feel that people were not looking at me like I was in a car accident. I put on some makeup on my neck, below my eyes and on my cheeks. I looked great. Sleeping at night was difficult because of the swelling around my ears and I am a side sleeper. It was hard and more difficult sleeping on my back with two pillows. Another tip: make sure you have enough cover up foundation make up at your home. Day 6: On my outing to the grocery store, I saw a friend and they said I looked so rested. Bingo! That is what I wanted. No more tired old face that everyday someone was asking me when I was retiring. Day 7: Back to Dr. Samson’s office and I felt great! The ladies in the office made me feel even better and I could not believe how fast I was recovering. I do bruise easily but not so much for the face lift. I made an appointment to have a facial and peel in the future, also maybe a filler above my lips and between my eyes. Day 8: And beyond… My incisions around my ears are healing. Also, my neck is tight and I noticed my glands in my neck are enlarged but every day I feel better and better and my face looks great. I feel youthful and cannot wait to enjoy my new face for the rest of my life. "Selecting a cosmetic surgeon that was "right for me" proved to be a process that required research and consideration. For each of us, there are many qualities and characteristics to look for when selecting any physician; for myself, this was an important undertaking. I first needed to be honest with myself and address my own goals and desires and be able to express them properly. I wanted to make sure that my concerns were listened to, and that the feedback advice I received was clear and appropriate. I can say without a doubt that Dr. Samson of Samson Aesthetics was the perfect office for me! The entire staff at Samson Aesthetics went out of the way to make me feel at ease the moment I walked in through the doorway. I was greeted with beautiful smiles and a very professional but caring atmosphere! Dr. Samson proved to be very knowledgeable, extremely patient, earnestly kind and very sincere with his explanations for each procedure I questioned. I knew that my concerns were heard; I was set at ease while matching my expectations with his explanations. Each of us may have goals that are reasonable or not, and Dr. Samson helped me understand what my options were, and what I could expect as a result for each. He treated me holistically, taking care of emotional concerns as well as the ones that were physical. He set realistic expectations for me and provided excellent results. Dr. Samson will make it his priority to see that you also have a complete understanding of the desired procedure. As you listen, he will describe to you in detail exactly what to expect. As your consultation progresses, you will have the opportunity to express your thoughts without feeling rushed or dismissed; Dr. Samson genuinely cares to fully understand his patients. Whether discussing simple procedures such as Botox and/or fillers or if you might be interested in a more permanent surgical procedure, you can be sure that Dr. Samson has the expertise and the ability to offer an openly honest opinion and he will extend the appropriate advice. If you decide to become his patient, you can literally know that you are in the best of hands, and that you will be thrilled with the results! Dr. Samson will help you achieve the most natural and desirable "look" for your specific features. He is excellent in his field, he is an extremely knowledgeable and proficient artist and he is a talented professional. Dr. Samson and his staff provided wonderful communication skills which is essential to good "Dr. /Patient" relationships. The results of the procedures he performed exceeded my expectations. If you are looking for any cosmetic procedures...you can know that there is no better choice than Dr. Michel Samson, MD, FACS, PLLC"